How Many Customers Does MetroPCS Have? AT&T Randall Stephenson says that MetroPCS is a viable competitor to AT&T with only 8.9 million customers. 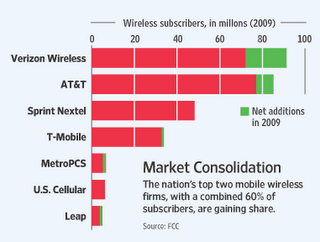 AT&T has 90 million customers so is that a fair comparison of wireless competition. That is 1/10 of the customers and eventually 1/12. MetroPCS is a discount carrier and their customers are mostly post paid. There is no way that MetroPCS has a the resources or the smartphone handsets to compete.